If you are like most B2B SaaS company leaders, you send your buyers an Net Promoter Score survey out to gauge loyalty and solicit feedback. If you are focused on retention, you need to know the answer to the NPS question: How likely are you to recommend my product or service? However, you may be hesitant to ask the same question of the hundreds of end users of your product. The fact is end users are your customers, too. After purchase it is your end users that must become the champions of your product. If they are unhappy they will tell your decision makers or, worse, let their feelings be known on social media. Knowing what end users think of your product is invaluable, essential intelligence for your QBR. Whether you are in Sales or Customer Success, here is how end-user feedback plays into your Quarterly Business Review with your key stakeholder. He or she may not know how happy or unhappy their people are with your product. But you do! Scenario 1: End users are happy. Imagine being able to tell a VP of Product or CMO that end-users gave your product a 52 NPS, and rattling off some of the great verbatim feedback you’ve received from promoters. You’ve harnessed that brand advocacy. Now picture a competitor cold-calling your client. Is that VP even going to take the call and “explore other options”? No way. Not a good use of her time. Either way, you are a proactive, knowledgeable and trustworthy partner to your stakeholders. Get the ebook, The Modern Guide to Winning Customers with Net Promoter Score. Learn how to modernize your NPS program for growth and higher loyalty with end-user feedback. Hearing directly, day in and day out, from end users provides a pulse of sentiment and qualitative feedback that Product teams need. There is nothing like hearing about a new feature directly from a user. And, users will identify a bug before the company can — you have an quality control army to support you. Some SaaS companies, like Magoosh, use in-app Net Promoter Score survey feedback to A/B test product versions for customer happiness. The product team at Hootsuite adds a feature to each quarterly roadmap that is derived from end user NPS feedback. Lengthy email surveys are not appropriate for end users. You need to know if users like your product, if they’d recommend your product, if it actually helps them in the way they need. You don’t need a lengthy survey to get actionable feedback from them. Plus, even if you do have their email contact information, that isn’t a channel they expect to hear from you in. If you send users a survey via email, they might not recognize who it is coming from. 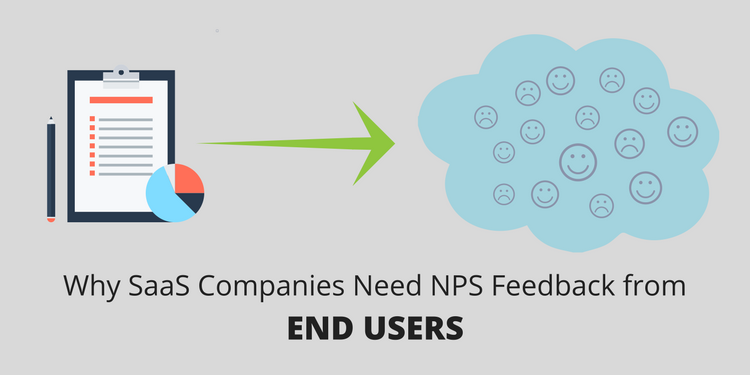 Use in-app NPS surveys to get the information you need from users of your SaaS product. Surveys inside your SaaS application will give you the contextual feedback you need in real-time. And the best part is that a well-designed in-app survey is unobtrusive. It won’t interrupt the work that users are doing in your product. When a user opts to respond, it will only take them seconds to do so. 2. I don’t have a relationship with end users. B2B SaaS companies often do not interact with the end-users of their product. Historically, even getting to the end user was nearly impossible. You may have communicated with one or several stakeholder decision makers that have signed off on the subscription purchase, but not had a single email address for the people actually using the product every day. This is where in-app surveys truly shine. Users have an existing relationship with you through your product, and are more likely to give feedback when asked within the product experience. 2. The volume of responses is scary. The idea of going from 2 or 3 survey responses per account to hundreds can sound overwhelming. With modern Voice of the Customer software platforms though, feedback is aggregated and analyzed for you–often using machine learning. Sending surveys is automated as well. You don’t have to create survey “campaigns.” You can drip Net Promoter Score surveys and get constantly updated, real-time feedback. That way you’ll never miss a trend. Alternatively, you can trigger Customer Satisfaction or Customer Effort Score surveys at key points in the customer journey. 3. I don’t know how to respond to end-user feedback. You can send set up an auto-message to thank users for responding to the survey. This can be customized based on whether the user was happy or had a complaint. Promoters, or highly satisfied customers, can be referred to Customer Success or Marketing for testimonials or case studies. Route unhappy end user responses to Customer Support for follow up. If responding to each user isn’t feasible, one simple way to close the loop is to create a blog article that talks about the feedback you’ve received and what you plan to do about it. 4. Am I going to mess up my corporate KPI by surveying end users? Segmentation can help here. Parse your metrics by buyer, admin and user, for example, to maintain continuity with previous buyer-only NPS data. If you believe that end-user feedback has value — there is a way! 5. Yikes. Am I REALLY ready to hear feedback about my product? This may be the single greatest fear we encounter! It takes a brave business to ask for real, unvarnished feedback from end users. And it takes a smart business to know how to use that feedback to build better products and improve user experiences. It’s not for the faint of heart. But it is essential for businesses hoping to grow, gain referrals, and lead their industries. A modern Net Promoter Score software platform can help make this organized and manageable. Modern CXM software will help you get it right. End user feedback will tell you your strengths and weaknesses, which are both valuable information. Understanding what end users love can strengthen your relationships with the decision makers. Knowing where end users get into trouble puts you ahead of negative feedback at reviews, ensuring you’re prepared with a game plan to remedy the issue and keep the account. Build end-user loyalty. Sign up today for free Net Promoter Score feedback with Wootric.